The Monkey got his fretboard yesterday and now we’re fine-tuning the frets. We’re almost ready for finishing. Here are some update pictures. 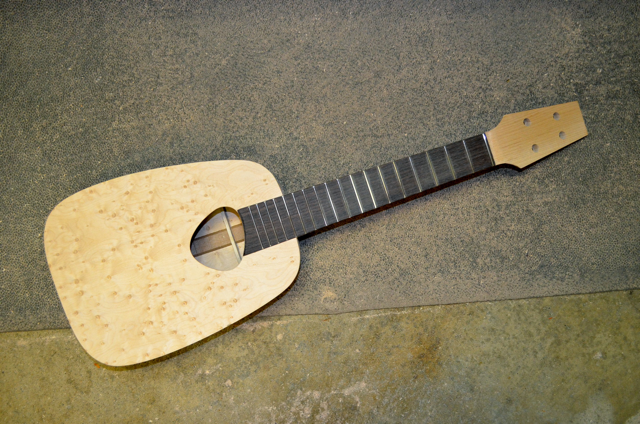 “The Monkey” is looking a lot like an ukulele now.His fretboard is in place and we’re fine-tuning the frets now. Then it’s on to finishing. 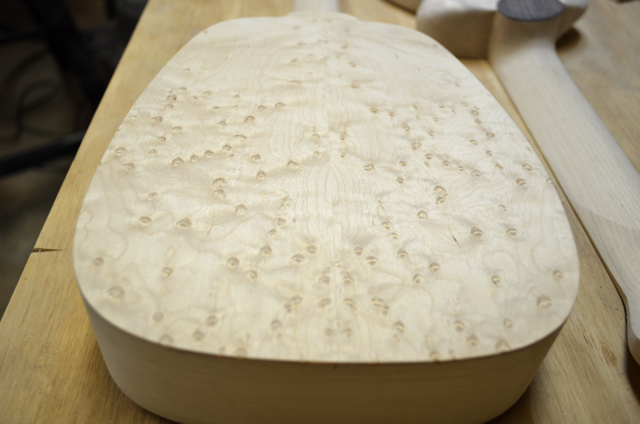 We’re cutting a Rosewood accent for the base of the neck. 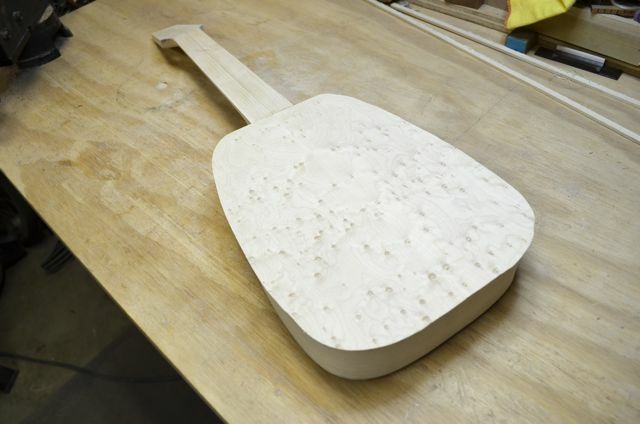 Once that is attached, it’s on to final sanding. The birdseyes on the soundboard are just wild-looking! …and the backboard is just as wild! Can’t wait to see finish on this wood. And so more updates to The Monkey. In this episode we attach the soundboard and backboard closing up the box. 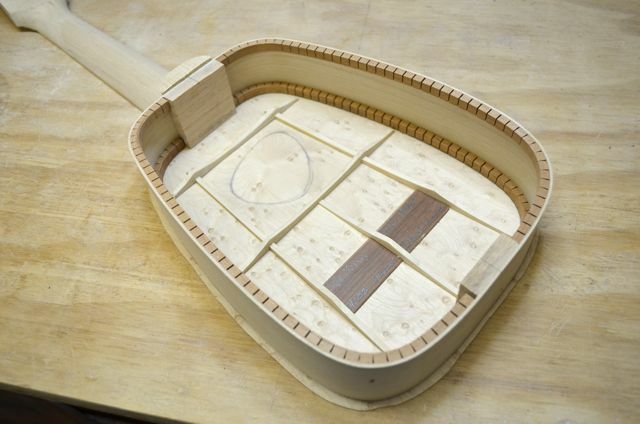 The Monkey is trussed up tight in the solera and getting its soundboard glued in place. 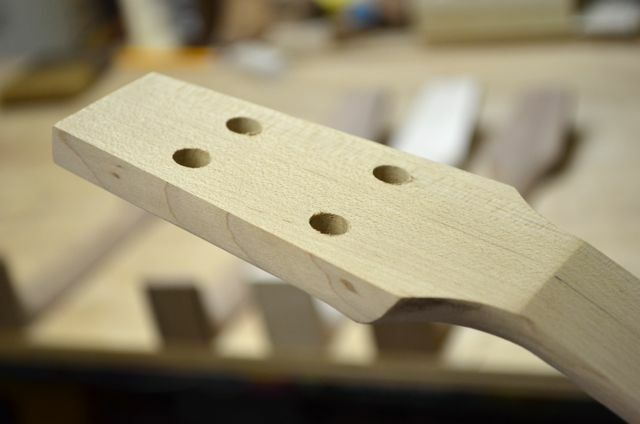 This is a most critical step because it sets the alignment of the neck. The solera keeps everything in sharp alignment. We braced the backboard and now the box is closed up. 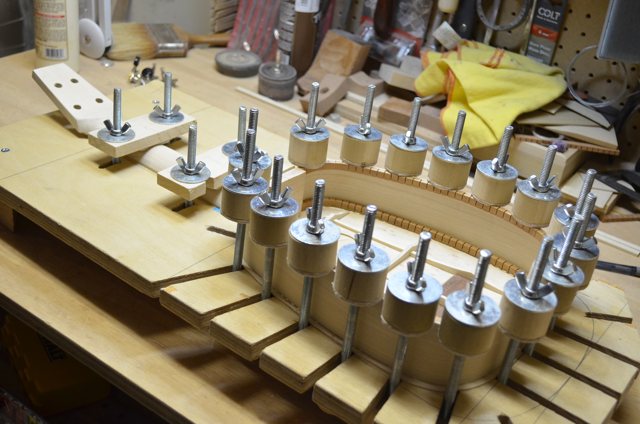 Our solera with its spool clamps can really put a lot of force on the boards for gluing. 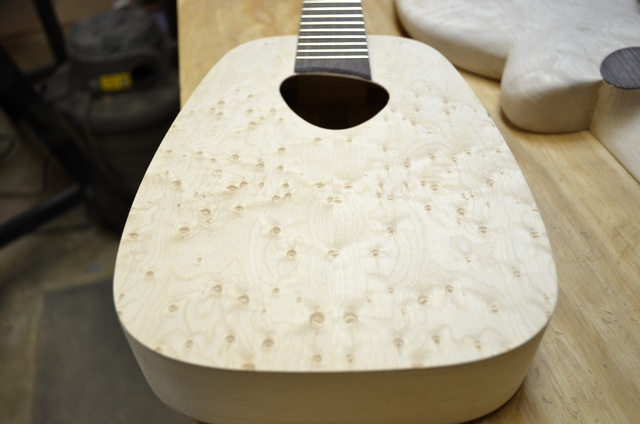 With the soundbox closed up we move on to the fretboard. 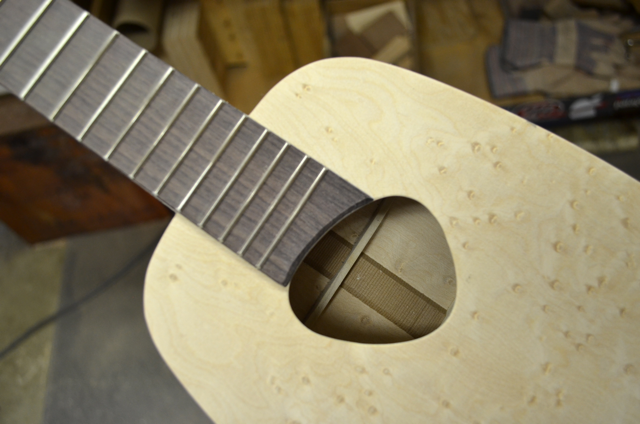 The Monkey is looking like an ukulele now! Progress! So we’re back in the shop and making great progress on The Monkey. Here are the pics. Quartersawn Maple for the neck. The neck is about 90% shaped at this point. 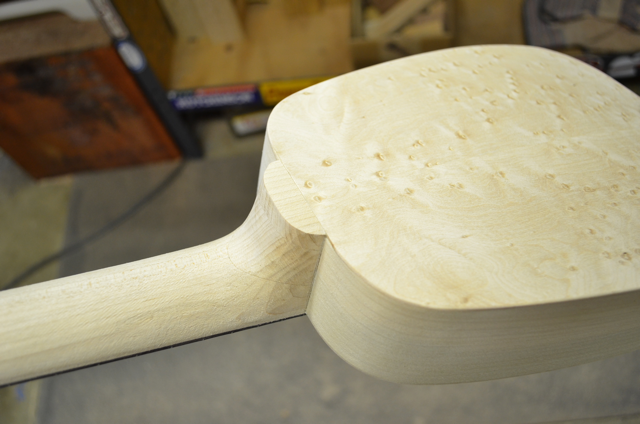 The width is set, the head is shaped and the pegholes drilled. See the nice parallel grain lines. We attach our neck with the body open. this allows us to get a lot of clamping pressure at the neck joint. With the neck attached, we get to bracing. I have to say, I dig bracing. This is our signature interlocking ladder bracing. Very lightweight and very strong. 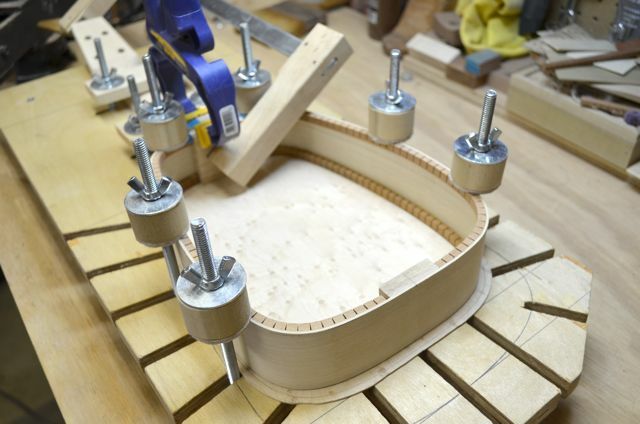 The Monkey’s soundboard is bookmatched Birdseye Maple. 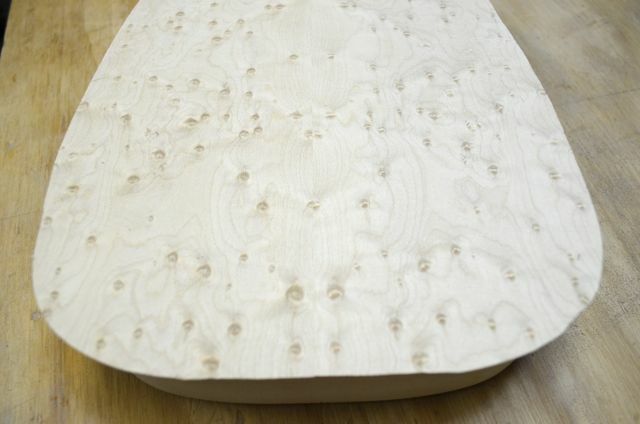 Birdseye Maple is some crazy-looking stuff. And they certainly got the name right. 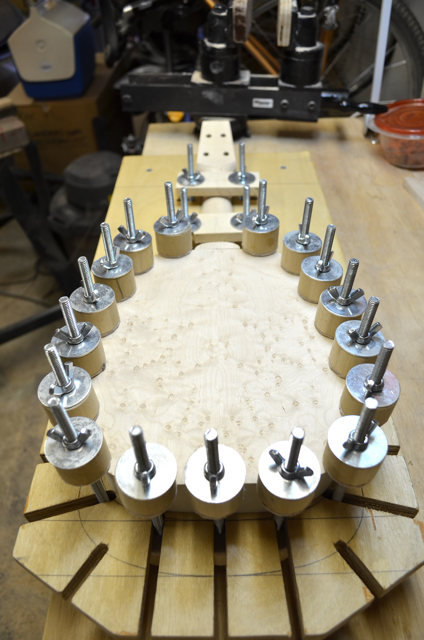 Next up, we’ll attach the soundboard, brace the back and then attach that too. Then it’s on to the fretboard. Progress!